I want to keep the logic of the aerodynamic model separate from that of the application running it. All of the gravity/friction/aerodynamic calculations is in a self contained aero library. The application itself is a separate project that ingests the aero library. - The application could be a game that has a lot of processing overhead rendering the objects to the screen. - The application could be research experiment where it is running one or many simultaneous orbital calculations and wants minimal overhead (no graphics rendering). - The application could be from some third party that does its own visualization / whatnot and just needs a way to have objects move in space. Rather than maintaining two tables of objects (one in the aero library and one in the host application), the orbital aero library has the one and only list. 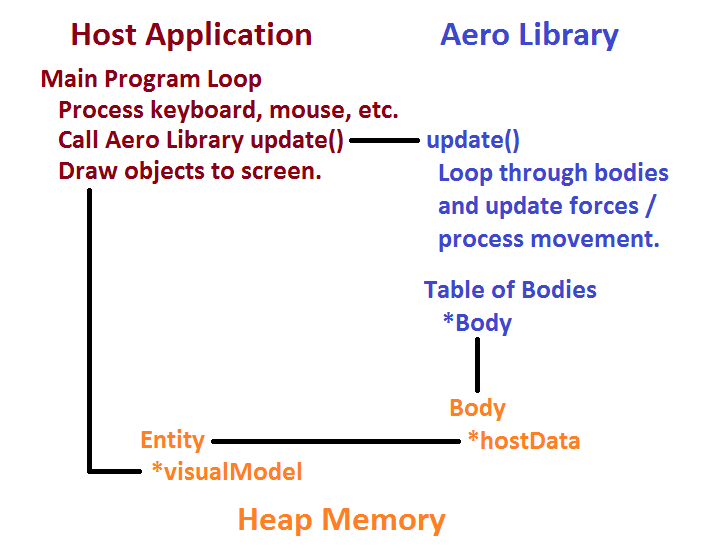 I'm using a pointer in the Body object in the orbital aero library to point to an Entity object in my host application. When a Body is created, two objects are created and added to heap memory: the Body object and an Entity object. 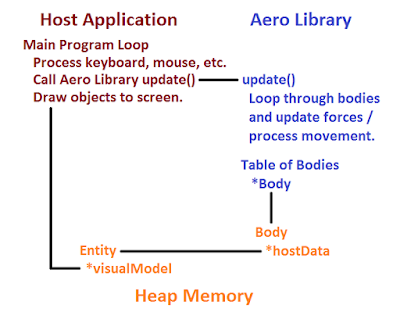 The aero library creates the Body object; the host application creates the Entity object. To tie the two together, the Body object has a hostData pointer to the Entity object. Since my application is doing graphics rendering, the Entity object has a pointer to the visual model that will be drawn on the screen. Eventually the Entity object will contain lots of information that should be tied to the Body but has no purpose within the aero library. // Table to hold all the bodies. void *hostData; // Pointer to data structure populated by host software.